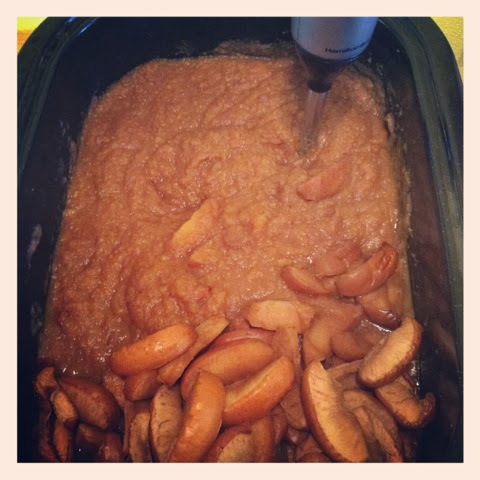 At Home with Chas: Applesauce, again??? Let's talk applesauce one more time, shall we? I've been making applesauce and apple butter for a long time. Usually only one way. This year I have tried several different methods. All good, but I believe I have found my all time favorite way, and I am going to share it with you today. What I have been doing recently is wedging the apple. I used a tool like this one below. It's an apple wedger. It will core and wedge the apple slices. The cores go in the compost or to your barnyard family and the apple wedges go into the crockpot or as I used, the roaster. (I've got 80+ lbs of apples to go through). The picture below is the type of roaster I am talking about. Anyhow, I used the roaster and tossed in my apple wedges, my sucanat and water. I let them cook... low and slow. The roasters can get very hot, and you don't want scorched apples. I cooked mine around 200*, you may even go down to 150*-175* if yours gets really hot. Once cooked, I use an immersion blender and blend it thoroughly. If you don't have an immersion blender, the food mill I showed the other day is another great alternative. This is by far my most favorite way. I have no problems with the apple peels, I think it even helps to thicken the sauce. The core is thrown out, so there is no waste. Everything is blended together and you have lots of sauce. I love to find new and better ways of doing something. It's a very good thing!